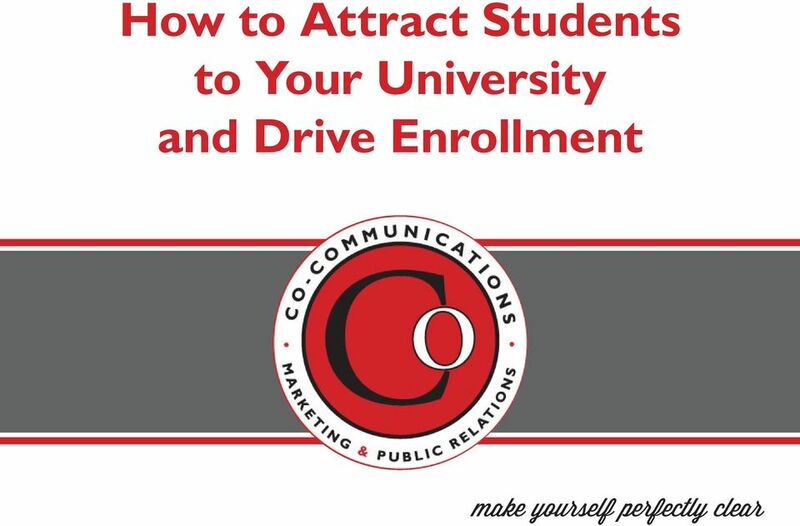 Download "How to Attract Students to Your University and Drive Enrollment. make yourself perfectly clear"
2 Attracting students to a college or university is a competitive process. 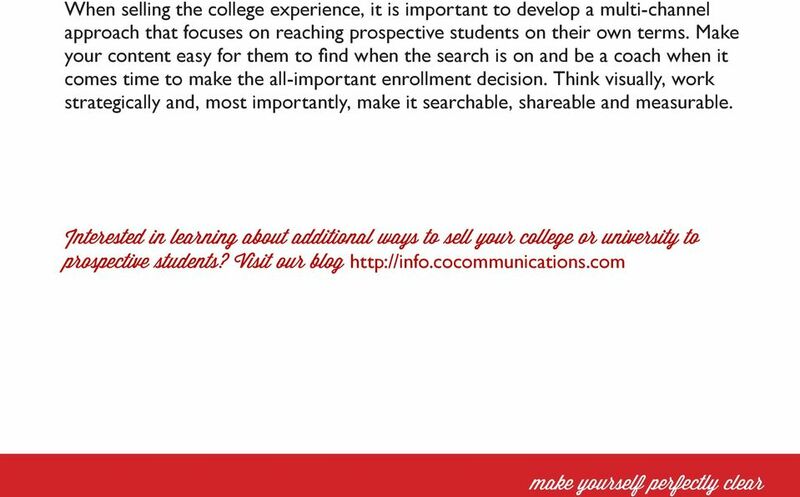 With countless options to choose from, colleges and universities need to leverage traditional, social and inbound marketing and communications tactics and strategies to increase enrollment. It s not enough to have great programs and great faculty. 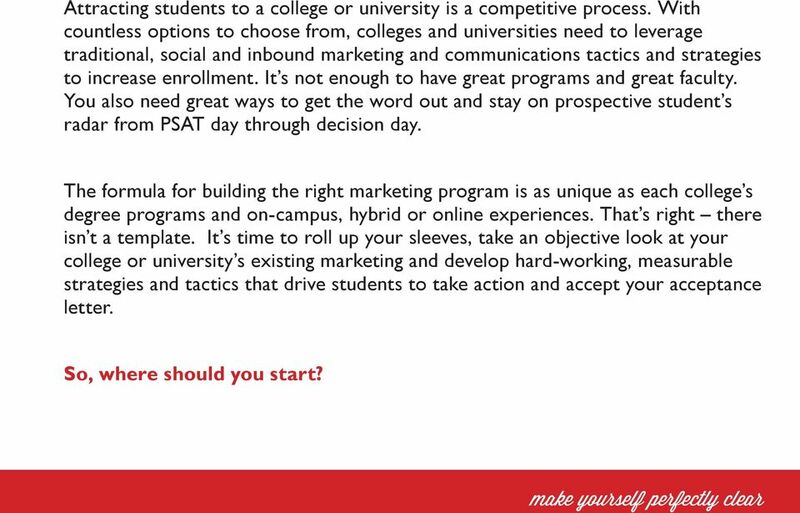 You also need great ways to get the word out and stay on prospective student s radar from PSAT day through decision day. The formula for building the right marketing program is as unique as each college s degree programs and on-campus, hybrid or online experiences. That s right there isn t a template. It s time to roll up your sleeves, take an objective look at your college or university s existing marketing and develop hard-working, measurable strategies and tactics that drive students to take action and accept your acceptance letter. So, where should you start? 4 2. 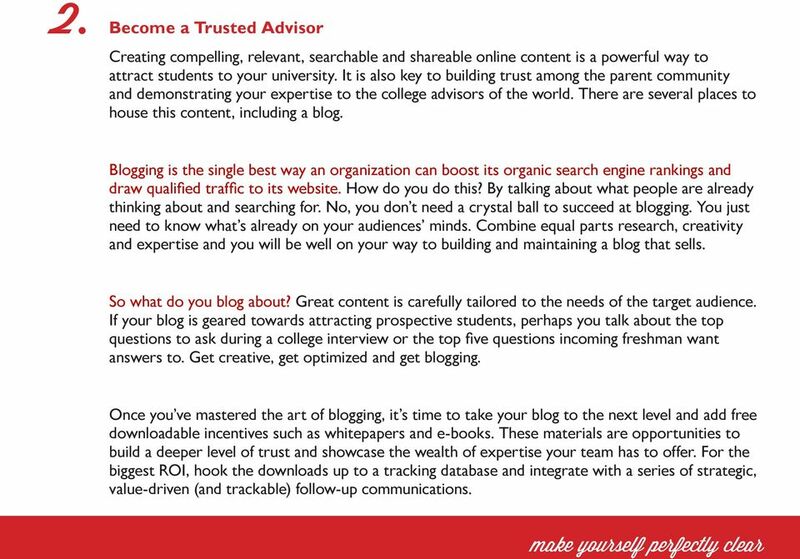 Become a Trusted Advisor Creating compelling, relevant, searchable and shareable online content is a powerful way to attract students to your university. It is also key to building trust among the parent community and demonstrating your expertise to the college advisors of the world. There are several places to house this content, including a blog. Blogging is the single best way an organization can boost its organic search engine rankings and draw qualified traffic to its website. How do you do this? By talking about what people are already thinking about and searching for. No, you don t need a crystal ball to succeed at blogging. You just need to know what s already on your audiences minds. Combine equal parts research, creativity and expertise and you will be well on your way to building and maintaining a blog that sells. So what do you blog about? Great content is carefully tailored to the needs of the target audience. If your blog is geared towards attracting prospective students, perhaps you talk about the top questions to ask during a college interview or the top five questions incoming freshman want answers to. Get creative, get optimized and get blogging. Once you ve mastered the art of blogging, it s time to take your blog to the next level and add free downloadable incentives such as whitepapers and e-books. These materials are opportunities to build a deeper level of trust and showcase the wealth of expertise your team has to offer. For the biggest ROI, hook the downloads up to a tracking database and integrate with a series of strategic, value-driven (and trackable) follow-up communications. 5 3. 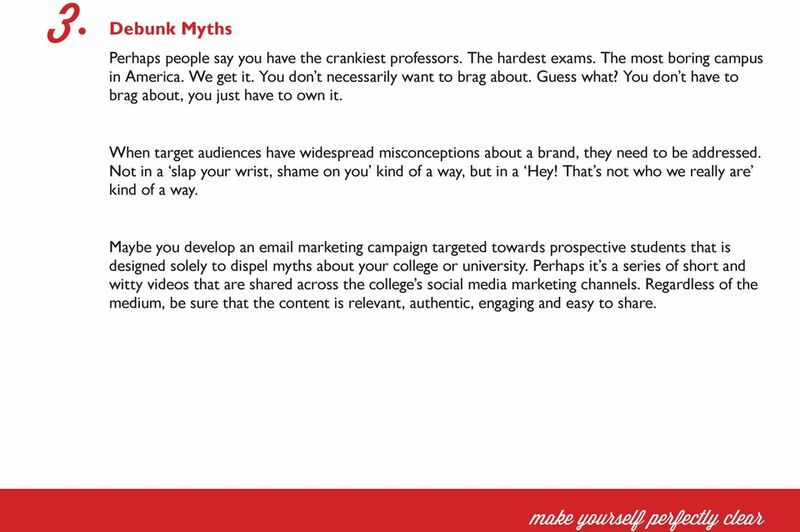 Debunk Myths Perhaps people say you have the crankiest professors. The hardest exams. The most boring campus in America. We get it. You don t necessarily want to brag about. Guess what? You don t have to brag about, you just have to own it. When target audiences have widespread misconceptions about a brand, they need to be addressed. Not in a slap your wrist, shame on you kind of a way, but in a Hey! That s not who we really are kind of a way. Maybe you develop an marketing campaign targeted towards prospective students that is designed solely to dispel myths about your college or university. Perhaps it s a series of short and witty videos that are shared across the college s social media marketing channels. Regardless of the medium, be sure that the content is relevant, authentic, engaging and easy to share. 6 4. 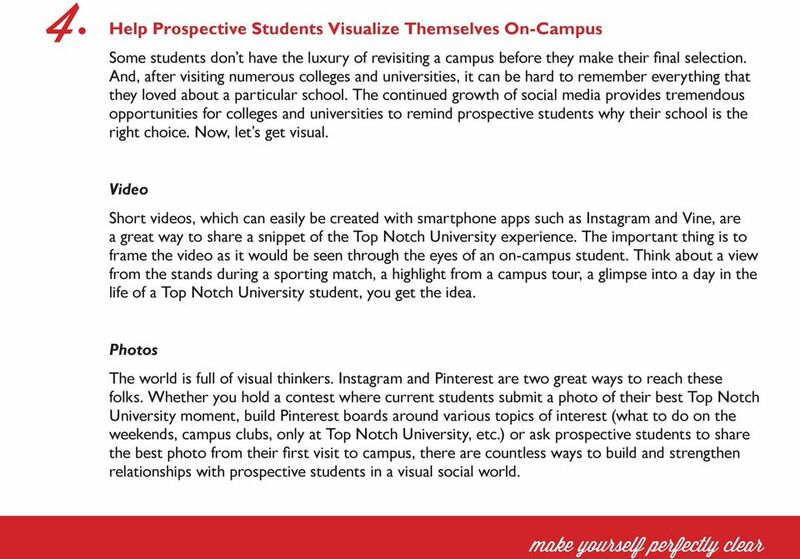 Help Prospective Students Visualize Themselves On-Campus Some students don t have the luxury of revisiting a campus before they make their final selection. And, after visiting numerous colleges and universities, it can be hard to remember everything that they loved about a particular school. The continued growth of social media provides tremendous opportunities for colleges and universities to remind prospective students why their school is the right choice. Now, let s get visual. Video Short videos, which can easily be created with smartphone apps such as Instagram and Vine, are a great way to share a snippet of the Top Notch University experience. The important thing is to frame the video as it would be seen through the eyes of an on-campus student. Think about a view from the stands during a sporting match, a highlight from a campus tour, a glimpse into a day in the life of a Top Notch University student, you get the idea. Photos The world is full of visual thinkers. Instagram and Pinterest are two great ways to reach these folks. Whether you hold a contest where current students submit a photo of their best Top Notch University moment, build Pinterest boards around various topics of interest (what to do on the weekends, campus clubs, only at Top Notch University, etc.) or ask prospective students to share the best photo from their first visit to campus, there are countless ways to build and strengthen relationships with prospective students in a visual social world. 7 5. 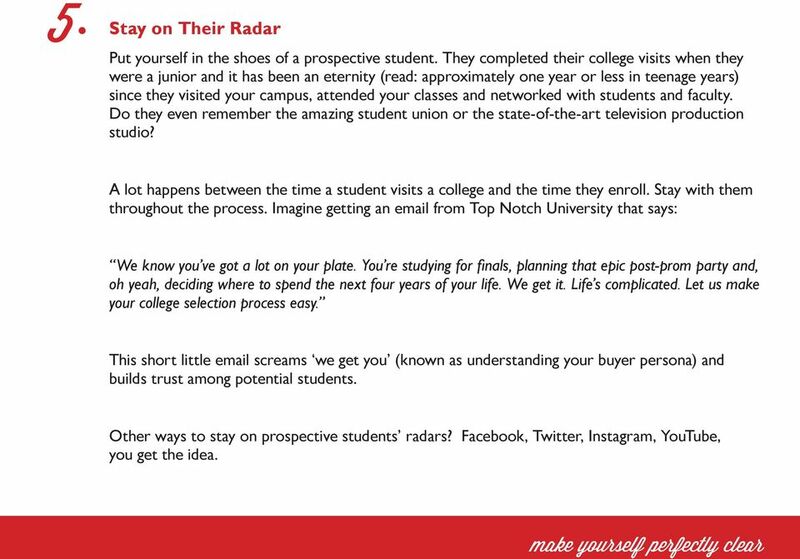 Stay on Their Radar Put yourself in the shoes of a prospective student. They completed their college visits when they were a junior and it has been an eternity (read: approximately one year or less in teenage years) since they visited your campus, attended your classes and networked with students and faculty. Do they even remember the amazing student union or the state-of-the-art television production studio? A lot happens between the time a student visits a college and the time they enroll. Stay with them throughout the process. Imagine getting an from Top Notch University that says: We know you ve got a lot on your plate. You re studying for finals, planning that epic post-prom party and, oh yeah, deciding where to spend the next four years of your life. We get it. Life s complicated. Let us make your college selection process easy. 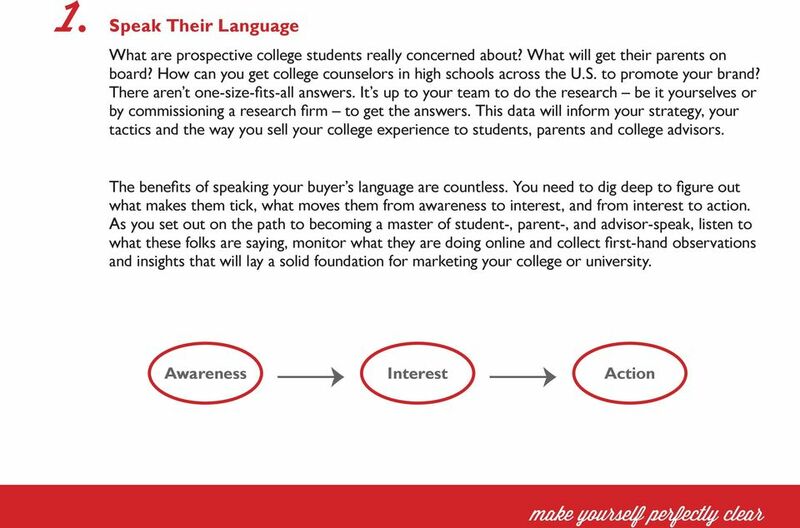 This short little screams we get you (known as understanding your buyer persona) and builds trust among potential students. Other ways to stay on prospective students radars? Facebook, Twitter, Instagram, YouTube, you get the idea. Big vision for small business. Internet and Digital Marketing Certificate This program focuses on helping marketers build and sustain successful, integrated digital media marketing programs, an indispensable part of effective marketing. The Basketball Trainer s Website Marketing Automation BluePrint How to Improve your Online Marketing Strategy to Attract the Long Term Clients you Really Want 01. INTRODUCTION 4 Overview & Breakdown 02. YOUR ULTIMATE GUIDE TO HIRING AN INBOUND MARKETING AGENCY DELIGHT INBOUND 1 INBOUND GIVES YOU AN UNDENIABLE ROI Shifting from outbound to inbound marketing provides an undeniable return on investments. The Modern Marketing Playbook REVENUE RIVER copyright 2014 Introduction: If your business has struggled to find your digital marketing identity, the problem is likely in the plan or the execution. Or both. Attention is a Currency. We earn it, we spend it, and sometimes we lose it. Why now is the time to invest in digital experiences that matter. $ $ HOW TO TURN FACEBOOK FANS INTO PAYING CUSTOMERS. A Guide to Using Facebook to Improve Lead Generation and Increase Sales.